Lila Monti, payasa argentina. : Moving the Clowns! 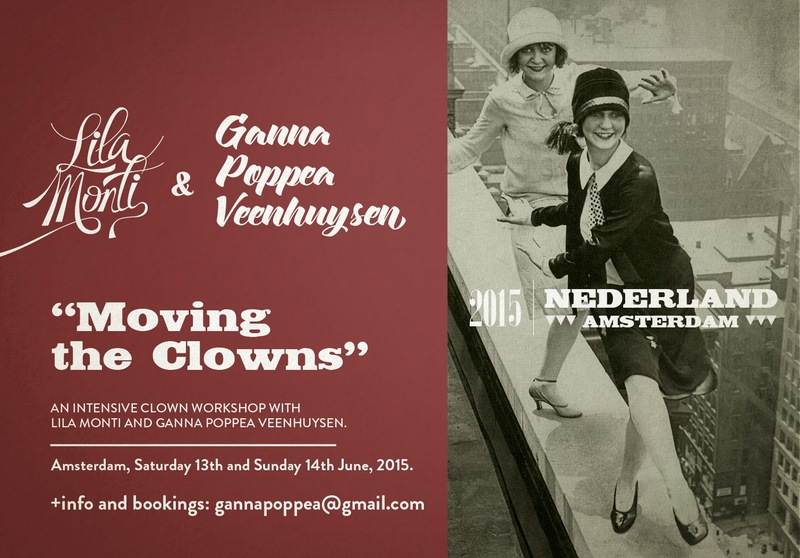 An intensive Workshop about Clowning and Motion, with Ganna Poppea Veenhuysen & Lila Monti. How does a Clown body move? Is there any difference in between your "RegularHuman" body and your Clownbody? Does Motion (or/and absence of Motion) means the same thing in "RegularHumanBeings" and Clowns? Can you create/discover/recreate some emotions through your body shapes? How many different possibilities can you investigate and develop in your body, to transform and let your Clown grow? Can an outfit, or a hat open a new side of your Clown? How does your Clown dance? Does he or she dance always in the same way? Which part of your Clown body gets activated with anger, or joy? What happens with yourClown if you get completely exhausted? And what if you have to be completely motionless? We've got all these questions. And we believe that looking for the answers will guide us to some powerful places. Because we feel that Clowns are very alive creatures. And, for us, Life is Motion. So, that's why we offer this Workshop: To move the Clowns and let them grow, change, play, sing and develop much more that we can just think. .Getting in contact with the clown’s own emotions and transforming impulses into clear actions. .Creating a strong link between the clown and the audience using mostly the body tool (including the voice). .Interacting with partners mostly through body "skills" and "lacks"
.Projection, availability and stage presence. .Passage through fragility, failure and exposition.